Join the Peel Law Association for our next CPD, Everything you need to know about Business and Income Valuations Part One: Valuators, which will be held on June 5, 2017. This program will provide 2.0 Hours toward the Law Society of Upper Canada Continuing Professional Development requirements. For further details, please see the attached flyer/registration form. Not a member, but looking to become one? Please follow the links for the membership form, fees, and a full list of PLA Membership Benefits. You may also contact the PLA Library Staff by email, and they will be happy to assist you. It only takes moments to join, and the PLA Library Staff can process memberships on the spot. Once payment is received, you can take advantage of all your PLA Membership Benefits, including discounts on CPD programs and social events. Each week watch this space for our weekly promotion, highlighting one of the books recently added to the PLA Library collection, as well as old favourites we think may be of interest to our PLA Library users. 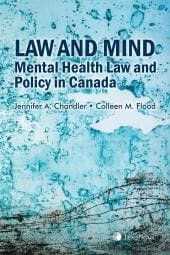 This week, the spotlight is on the book, Law and Mind: Mental Health Law and Policy in Canada by Jennifer A. Chandler and Colleen M. Flood, which was recently added to the PLA Library Collection. Mental health issues pose critical challenges for Canada's systems of justice and health care. Problems with mental health are common, but often neglected due to stigma and the vulnerability of those living with these conditions. This is evident within our legal system. Every day in our courts we see played out the struggle to protect the human rights and dignity of individual Canadians with mental health challenges, to access adequate mental health care and social support, and to provide genuinely helpful responses to criminal behaviour associated with mental health problems. Law and Mind: Mental Health Law and Policy in Canada provides a comprehensive analysis of the most important cases and key debates at the intersection of mental health law and policy. Written by a group of Canada's leading experts on mental health law, this volume provides practitioners, researchers and policy-makers with valuable insight into this challenging and important area of the law. Did you know... Members receive a discount on all PLA CPDs? The PLA hosts multiple CPDs each year, including programs that focus on Criminal Law, Family Law, and Wills & Estates Law. In 2016, CPDs included, The Brampton Courthouse Series #10: Family Conferences Under the Last Rules Amendments, PLA Real Estate Section Presents: Practice Review Essentials, and Appeals Everything You Wanted to Know but Were Afraid to Ask. The PLA has multiple CPDs lined up for 2017. Topics include: A Back to the Basics Criminal Series, DivorceMate Software Advanced Training (exclusive to members only), and a CPD on Estates Law. As a PLA Member, you will receive a discount on the fee to attend the CPD as well as advanced notice, via email, highlighting the details of each CPD. Not a member, but looking to become one? Please follow the links for the membership forms, fees, and a full list of PLA membership benefits. You may also contact the PLA Library Staff by email, and they will be happy to assist you. 2017 PLA Memberships are now due! 2016 PLA Membership benefits expired on February 28, 2017! Some additional PLA membership benefits include overnight circulation privileges, photocopy tab, borrowing gowns and tabs for court, discounts on PLA CPDs and social events as well as the free website lawyer referral service. Forms are attached below for you to download and complete. Forms must be completed before payment is accepted. If you wish to pay by VISA or MasterCard, you can Email or fax (905 451-3137) your forms into the PLA. Please follow up by calling the staff with your credit card information. Other payment options include mailing the completed forms along with a cheque or making a payment in person at the PLA Library via cash, cheque, VISA, MasterCard, or Debit. Please note the following information regarding the roads entering and exiting the Brampton Courthouse which will commence this Saturday, April 22, 2017 at 1:00 p.m.
As part of the courthouse addition project, the main entry road from Hurontario St. will be closed and a temporary access road around the construction area will be utilized. It is anticipated the existing road will be closed and new road will open on Saturday, April 22, 2017.